Lutterworth Town suddenly find themselves six points adrift of leaders Anstey Nomads – with a game in hand – after their game was postponed on Saturday but their rivals went ahead and won. Nomads then followed up that 3-1 success over St Andrews by beating Birstall 7-0 in the midweek to open up a bit of space at the top. So the Swifts will be keen to get back into action when they host Sileby Rangers this weekend. But they will also have an eye on what happens at Anstey who have a tough encounter with third-placed Melton Town. It promises to be a day that gives a clearer picture on how things will pan out in the title race. Potentially there could be a nine-point difference between leaders and chasers but alternatively it might be three teams within three points of each other. 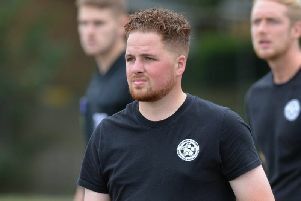 Not that Lutterworth manager Josh Dixon is letting his attention drift too far from Dunley Way just yet. “The tables have turned a little bit at the top,” he said. “We didn’t play at the weekend and they have taken advantage and gone and won. “It’s difficult to know what the best result for us would be from their game this weekend – only afterwards will we really know what the best scenario is. “We’ve all spent a lot of time looking at each others results and you can worry about it too much. Whatever happens this weekend, it should still shape up to be an exciting race. And while the fight for top spot might be taking it out of the sides involved, Dixon admits it is providing entertainment for the neutrals. “For everyone looking in it is really good,” he added. 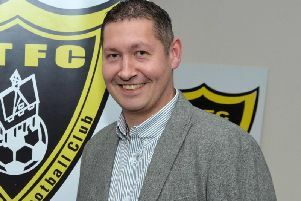 “It’s also really good for the league as it is grabbing the attention. “No one is running away with it. “For us it is a rollercoaster. “One week you feel you’ve got a grip, next week someone else has got the edge again. “What I do know is there are three very good teams fighting it out and the table will never lie at the end of the season. “Another motivation is we’ve been up there all season and really don’t want to let it slip now. Lutterworth Athletic’s match at home to Burton Park Wanderers was also called off on Saturday and they will try again this weekend when they go to Birstall United. In the Premier Division, Harborough Town were also not in action as their scheduled opponents, Leicester Nirvana, were in the FA Vase – a match they lost 2-1 at Canterbury City. The Bees now head to Lincolnshire for an away clash with Sleaford Town who sit one place below them but level on points having played two more games.